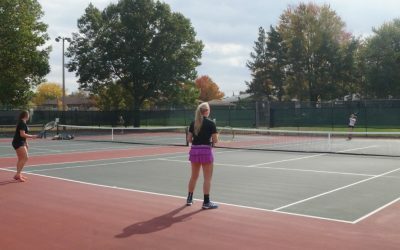 The Sarnia Tennis Club has scored a match point with council and is hoping the city will deliver a win with the province. Sarnia council agreed to directed staff to pursue land transfer discussions with the province Monday. The club is worried about rapidly escalating fees it pays to use provincially owned land behind the jail for its clubhouse and three of its tennis courts. While the province turned down the clubs request to purchase the land, it is open to discussing a land transfer with the city, which owns Brentwood Park where the clubs other three courts are located. Councillor Brian White asked the club if they’d consider relocating and rebuilding the clubhouse and courts in the park. Board member Blair Graham said it would be expensive. He said they just spent $120,000 to reconstruct the three courts in Brentwood Park. The tennis club has been located at Errol Road and Christina Street for 90 years. The non-profit organization has over 300 members — which pay for the facilities and activities through their fees. The land was originally transferred from the city to the county, which transferred it to the province, to build Sarnia Jail in 1961. F1 champ Jenson Button still flying high… in a Trophy Truck! Which NFL player will get booed the loudest at 2019 NFL Draft?